Looking beyond Mac OS X, this should work in Linux as well. This applies to what, 4 people? Nobody uses this stuff. Thank you. I thought I was the only one who used Nano. This set the default editor for the session. just add the line to .bash_profile then?? Yes, if you have one in your /home. nano is for idiots who can’t use vi. 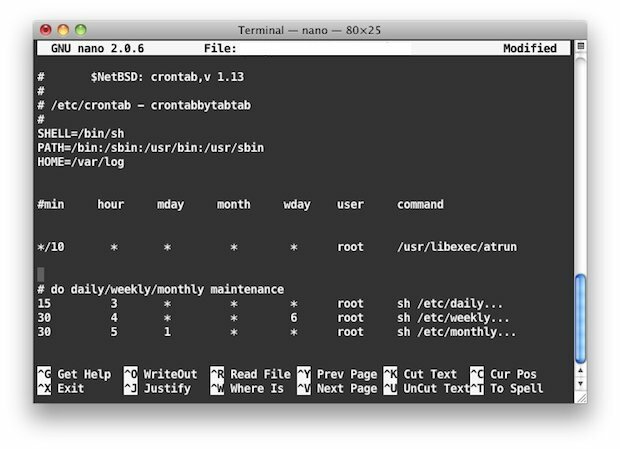 This is what happens when you put a MAC user in a UNIX shell. Actually nano is really easy to use which is why it’s used here and in most other tutorials. Sure vi is powerful and vi is great if you have a month to commit to memory the various keystrokes to interact with vim, but most Mac users have jobs that don’t involve tooling around in vi all day so they don’t get a chance to learn it, and trying to explain vim to the novice is a challenge, a bit like learning mandarin. Thanks for the tip! Very usefull. Love Nano, still not figured out Vi.